College life! Growing up watching movies every teenager dreamt the same college life. The one where you get to go out with friends, dress in casuals, bunk classes and what not! Life is expected to be as relaxing as it can be. But this is not the case and I am sure that every fresher in college would back me on this. Life in college is not as relaxing as it may appear. When you enter a college, you take your first step towards your career. Subjects that you study in college are not forced on you but are necessary in your pursuit of career. Once you are in college, you develop expectations from yourself. Your parents start having expectations from you. You enter into the real competitive world where your friend is your competitor as well. 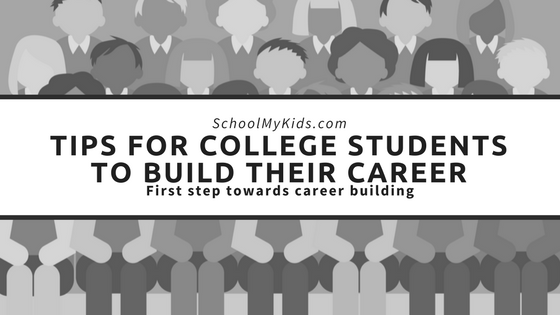 Read this article to know tips for college students to build their career. So, how to make yourself proud in college? How to differentiate yourself from the crowd? How to start being independent while still in college? Like I said, college life is that time in your life when you want to live your life to the fullest before starting your career but at the same time, it is also that time of your life when you have to build a base for your career. This article will tell you about all the things you can do in order to build your career base. 7 tips to build a strong resume and thus chances for a better future. Being a fresher out of college with zero experience it is difficult to land a good job. Doing an internship gives you an edge over other applicants applying for the same job. It not only increases your chances of selection but at the same time gives you the requisite amount of experience to start your career. They can also be a awakening call for you helping you understand your real passion. Being a member of a club or committee makes your resume more attractive to employers. Being a member of a club or committee highlights various features of your personality like team player, social, responsible, etc. It adds credibility to your resume. This is where you get to live best of both worlds. You have a great time enjoying with friends creating memories and also working, gaining necessary exposure and experience. Good grades don’t define you! True! But they still affect your future career aspirations. Having a better grade always has an edge. A bad grade might not necessarily harm your career but at the same time a good grade can help your career. So next time your friend asks you to bunk classes. Think about this. Apart from it being our ethical obligation, joining and working for a NGO is a must during college years. You get a chance to improve your networking as well as helps in professional development. It increases your employability chances. Nothing shows your responsible character than your voluntary work in an NGO. With a plethora of online courses available with most of them being free, it is a great opportunity for students to develop a new skill and at the same time get certified for it. Online courses not only save time but also help you to learn a new skill relevant for your career. This is one of the best thing you can do for yourself in college. Extracurricular activities are a must while in college. They increase your network and give you the confidence boost when competing against other teams. They are the stepping stones to achieving greater things in life. Participation and winning in competitions show your capability to handle competition and confidence. So never shy away from these competitions because in the end participation matters. There are many ways to network while you are studying in college, and many valuable contacts to be made. From speaking with your college alumni during alumni events to meeting with professors and family friends in the industry, networking is a time-tested way to get hired. So follow them and enjoy your college life responsibly! 10 Ways To Make Money In College – How to earn while studying in college?